Home / Review / CORSAIR K63 Wireless Mechanical Keyboard & Gaming Lapboard Review, gaming from your sofa! CORSAIR K63 Wireless Mechanical Keyboard & Gaming Lapboard Review, gaming from your sofa! Two years ago, the “Steam machine” craze motivated several manufacturers to conceive an innovative new device: the lapboard. This accessory is intended to allow keyboard and mouse aficionados to game in their living room while maintaining maximum comfort. The Corsair Lapdog, Razer Turret, and Roccat Sova were among the first of this type of product to become available. These days, interest in Steam machines is waning and Corsair – which has just released a new product called the K63 Gaming Lapboard – seems to be the only manufacturer to still believe in the potential of the lapboard concept. The idea behind the K63 Gaming Lapboard is, once again, to provide gamers interested in playing from the comfort of their sofa with a keyboard and mouse support. The K63 Gaming Lapboard is more highly evolved than any of its predecessors and Corsair’s gamble seems to have paid off. 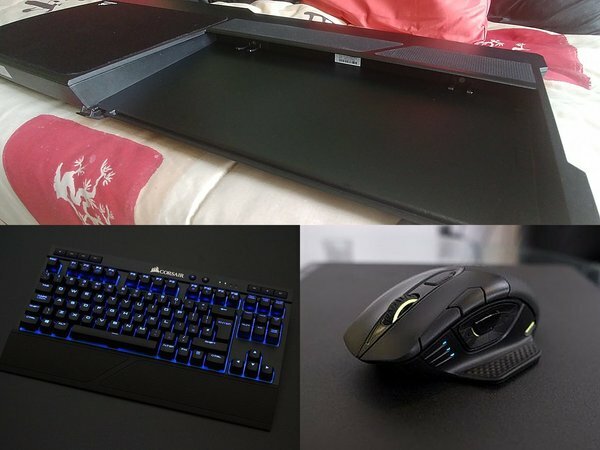 Upon unboxing, the K63 Gaming Lapboard presents the appearance of a large piece of plastic measuring 67 cm in length by 27 cm wide. 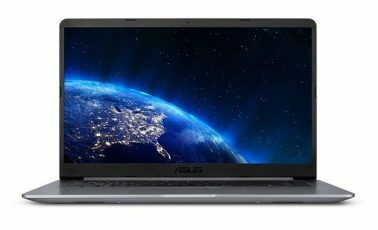 The K63’s suggested retail price is 60 euros, but it is not functional by itself. The empty void which is clearly visible on the adjacent photo is destined to be filled by the Corsair K63 Wireless keyboard – the only keyboard compatible with this lapboard. 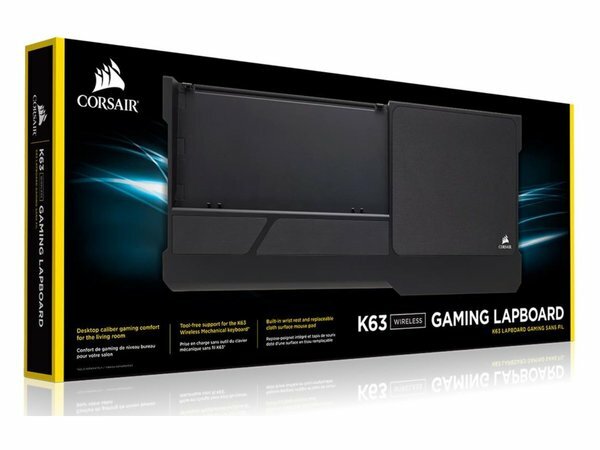 Corsair also sells a bundle (which can be purchased from most vendors) containing the K63 Gaming Lapboard and the K63 Wireless keyboard. Corsair recommends that its lapboard be used in conjunction with its Dark Core RGB Wireless mouse. 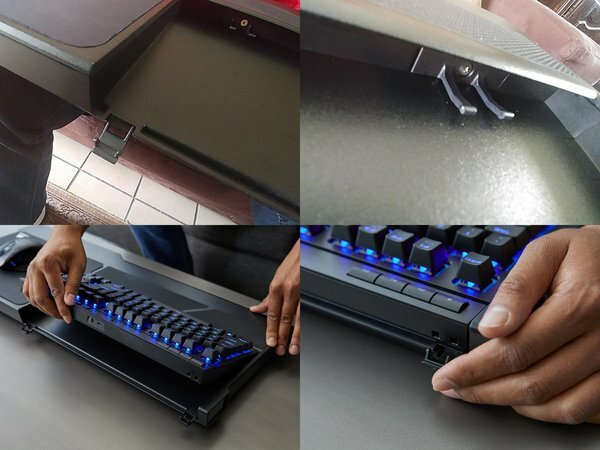 While the K63 Gaming Lapboard requires no assembly itself, it cannot be used without first mounting the K63 Wireless keyboard. 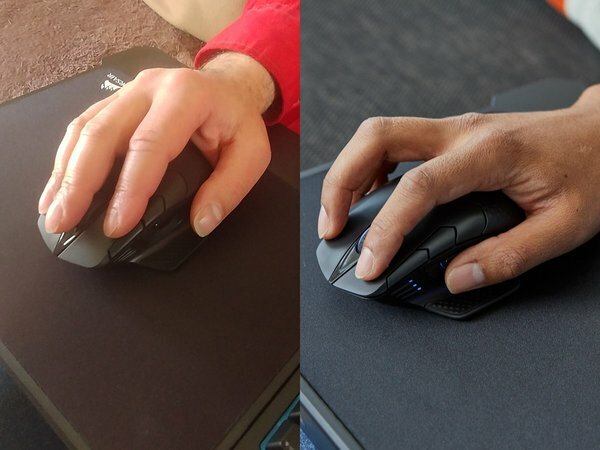 Corsair has vastly improved upon the attachment system it used on its previous model of lapboard (if you can call it that). To mount the keyboard, you will need to open the two clasps located on the front side of the lapboard. Next, slide in the K63 Wireless keyboard and close the two clasps. And you’re done! Your K63 Gaming Lapboard is now ready to use. It is worth mentioning that the keyboard does not even need to be unmounted in order to be recharged since its cable connector remains accessible at all times. Corsair has even given some thought to the long-term durability of its product and includes several replacement clasps with its lapboard. The K63 Gaming Lapboard is very comfortable to use. 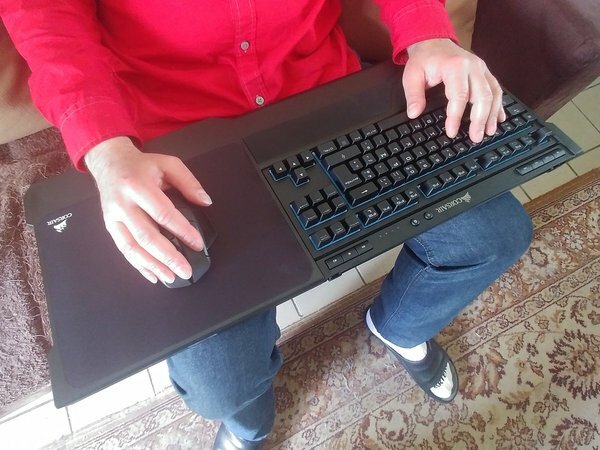 The lapboard’s wide grip zones allow it to stay in place on a user’s lap. 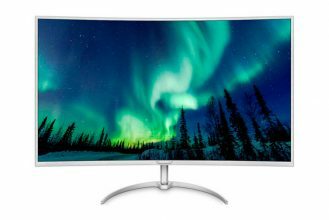 Despite its 70-centimeter width and weight of almost 3 kilograms (with keyboard installed), it is not in the least bit tiring to use – even during long gaming sessions. We intend to dedicate an entire article to discussing the K63 Wireless keyboard in greater detail. For the moment, suffice it to say that its integration with the K63 Gaming Lapboard is excellent. 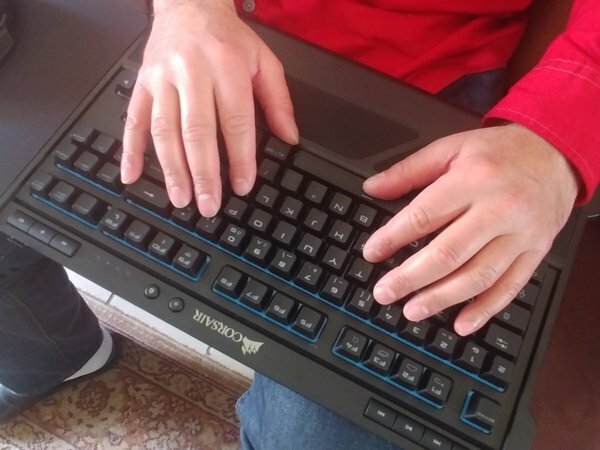 In conjunction with the K63 Gaming Lapboard, it is possible to perform speed typing from the comfort of your living room sofa. The K63 Wireless keyboard’s Cherry MX Red switches ensure excellent responsiveness and allow for fast, fluid, and accurate typing. A word of warning however: even though the K63 Lapboard’s structure is designed to limit noise propagation, the K63 Wireless keyboard’s switches can still be quite noisy. Also, we found the K63 keyboard’s rubber inserts to be too large to allow a user’s hands to rest comfortably on its keys while typing. Corsair recommends that its lapboard be used in conjunction with its Dark Core RGB Wireless mouse, but contrary to the K63 Wireless keyboard, this is not a mandatory requirement. You can use any mouse that you like, but in order to take full advantage of the lapboard’s portability, you will probably want to choose a wireless mouse. The imposing K63 Gaming Lapboard has a pad on its right-hand side reserved for a mouse. It is worth mentioning that this pad can always be removed if it gets worn out or if you don’t like the texture of its fabric. However, Corsair does not sell a replacement mouse pad for its lapboard. 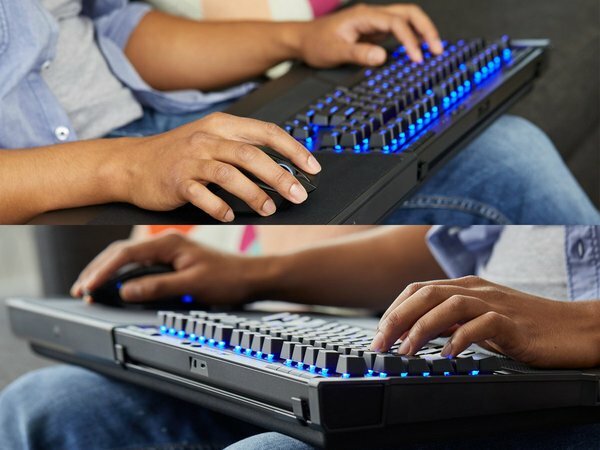 While most gamers prefer to play in a well-lit room, nothing prevents the K63 Gaming Lapboard from being used in pitch dark surroundings since the K63 Wireless keyboard incorporates a blue backlighting system. It should be mentioned that the K63 Gaming Lapboard does not contain a battery. As a result, it does not provide power to the devices placed upon its surface. 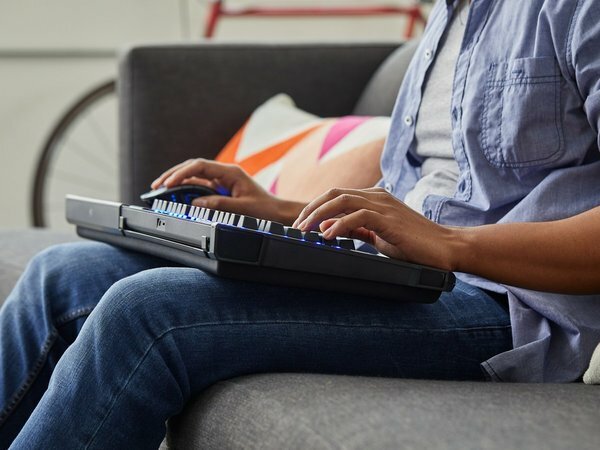 The K63 Wireless keyboard has a battery autonomy of around 20 to 25 hours with its backlighting set to low: a setting which is more than bright enough to make its keys readily identifiable. This peripheral device is geared towards a rather small audience: PC gamers who are interested in playing their favorite games from the comfort of their living room sofa. The K63 Gaming Lapboard is sure to satisfy anyone falling into this category – especially since Corsair has put considerable effort into refining its product’s finish quality.